Added by Indo American News on April 18, 2013. Healthcare professionals volunteered their services at the BAPS Charities health fair. STAFFORD: Many cars of today’s world have indicators when maintenance is needed and most of us typically follow this warning to extend the life of our cars. When it comes to the driver of the car, how often does he or she go in for routine health checks or screenings? The thought of periodic health check-ups is daunting for many. One organization that finds it important to promote healthy living and early detection of life threatening disease is BAPS Charities. 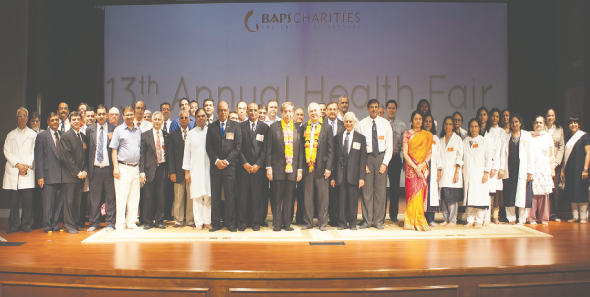 On April 13, 2013, BAPS Charities held its 13th annual health fair in Stafford, Texas at the BAPS Shri Swaminarayan Mandir. Tests being performed during the Health Fair. As most of us are very lost when it comes to the medical world, the health fair offered an opportunity for visitors to educate themselves through many of its sponsored booths and 8 interactive public health awareness seminars on educational topics such as heart-healthy life style, emergency preparedness, new health care policies, diabetes risk modification, prevention of osteoporosis, yoga and healthy smoothies for the general audience. “I learned how certain types of food are harmful to the body,” said Arjun Pandya “and that there are many vegetables like kale that can provide health benefits.” “Along with visitors walking away with an educational experience, many doctors learned of ways to improve their own practices and outcomes for their patients through medical lectures or CME. Each participant and allied healthcare professional was grateful to have sponsors like Medistar, Otsuka, and many others to contribute to this informative health fair. 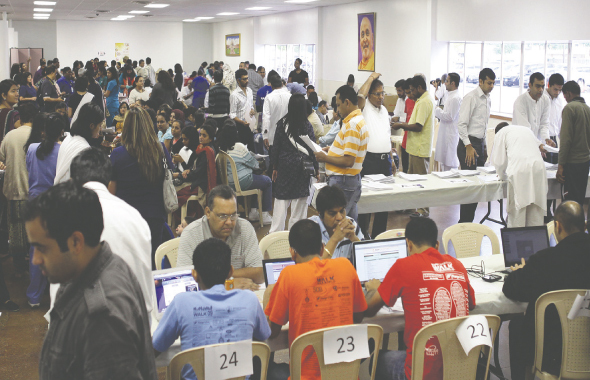 By the end of a beautiful Saturday afternoon, over 1200 participants and a combined 6000 different tests were conducted by 100 various health care professionals. “Out of 200 patients that I had a chance to screen today,” stated Dr. Ghanshyam Patel, Ophthalmologist, “10 of them were diagnosed with eye diseases that could have eventually led to blindness without detection.” Dr. Patel shared 45 patients had cataracts, 8 glaucoma risk factors and 20 with diabetic retinopathy. The dedication of each of the BAPS Charities volunteers can be seen from all of the services performed throughout the day. In 2012, BAPS Charities organized 38 such events throughout North America. In total, 1,720 health care professionals from local communities treated nearly 11,393 participants across the nation. Throughout the year, BAPS Charities hosts medical fairs, walkathons, education and career development seminars, disaster relief operations, blood drives and much more. BAPS Charities sincerely serves the community, by improving the quality of life of individuals and families.